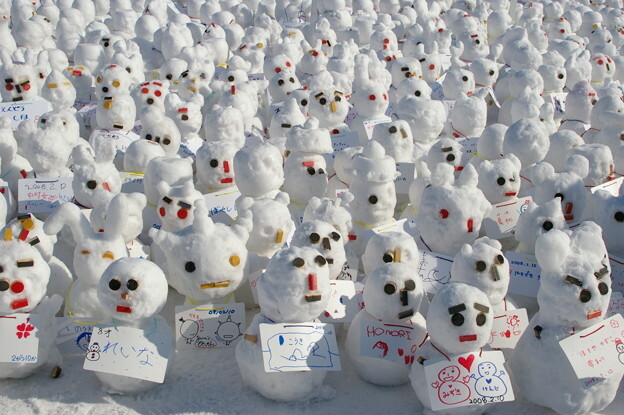 Home > Festival > ‘Do you wanna build a Snowman?’~ Here, at Sapporo Snow Festival! Sapporo Snow Festival is a winter festival, held every year in early February at Otaru City, Hokkaido. 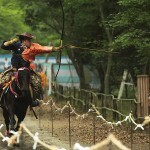 It is a one of biggest event that attracts 2.4 million visitors from both within Japan and abroad to Hokkaido. There are three venues which is the highlight of the festival: Odori Venue, Tsudome Venue, and Susukino Venue. There are large skillfully crafted snow sculptures Odori Venue, snow activities at Tsudome Venue, beautifully carved ice sculptures reflecting neon lights at Susukino Venue. Let’s experience Hokkaido’s culture through the 3 domes! 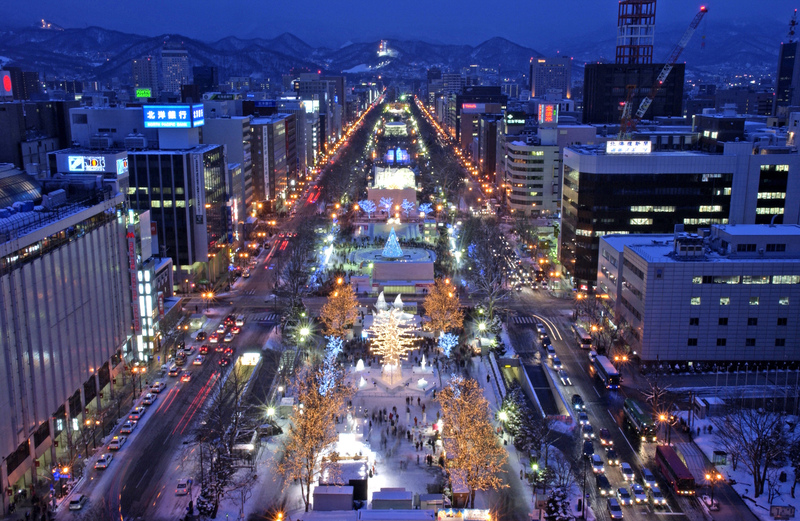 Sapporo Snow Festival has 3 venues: Odori Venue, Tsudome Venue, and Susukino venue. These three venues held different kinds of event. Here, we would like to introduce recommended spots of each venue! 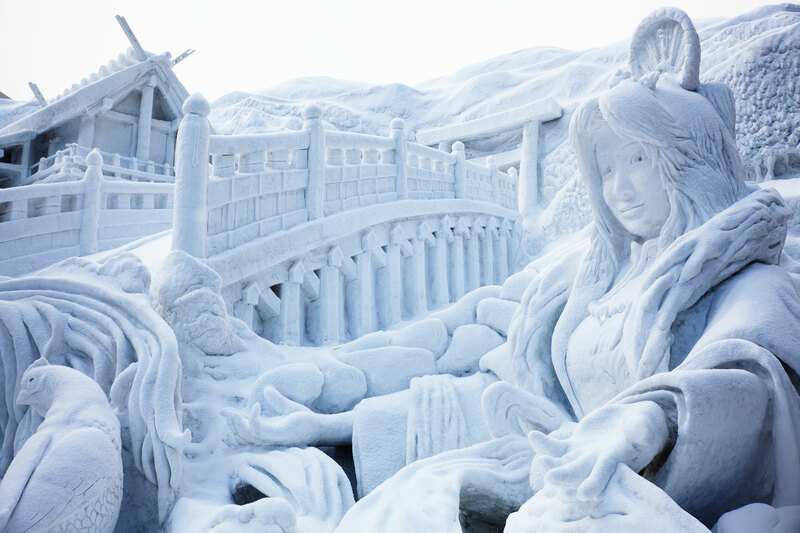 When speaking of Sapporo Snow Festival, people would often think about Snow Sculptures. There altogether 200 snow sculptures exhibit in all the three venues, with the main focus on the main venue at Odori Park. 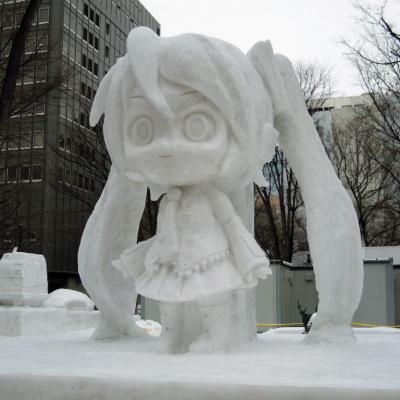 Most attention is paid to Sapporo Snow Festival’s “Large Snow Sculptures”. 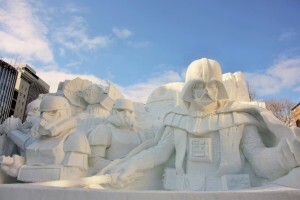 The theme of Large Snow Sculpture’s is different for every year from the world renowned architecture, trendy characters, celebrity who is the hot issue,etc. Some famous large sculptures are measure to be more that 15 meters high and 20~30 meters wide. Let’s show your creativity with small snow sculptures! At Sapporo Snow Festival’s Odori Venue, there are many unique small sculptures exhibited. These are either made by Sapporo citizen or teams of foreigners from abroad. Those sculptures usually depict one scene from a particular country’s mythology, object that represent the country’s unique culture, etc. Visitors can enjoy watching small snow sculptures in different ways from large sculptures. Snow Fighting in the Snow Kingdom! Outdoor Skating Rink is a popular family’s attraction. There are shoes for rent, thus, anyone can freely enjoy the ice skating. At night, the tree in the center of the rink and illuminations of the TV tower will make you feel mesmerized in the romantic atmosphere. There are also various events held at the stage on the rink side. In addition, there is also a ski experience corner and special courses prepared. Usage fee, shoes, Ski equipment rent is all free. Please do not miss this chance to experience the excitement of winter sports! Enjoy Fullload of Outdoor Activities! Tsudome is a venue with wide ground and indoor dome. It is a spot where visitors can enjoy snow activities experience. Children of 4 years and adult can enjoy Tube Slider, a popular attraction that glides through the snow. Visitors can freely participate in snowman crafting, observation of snow crystals using magnifying glass, etc. These excitement is not only limited to children, but adult can enjoy these activities together as well. Inside the dome, there is “DOSANKO Gourmet Street”, which gathered famous restaurant from all over Hokkaido. There are full-loads of curry rice, ramen, korokke, and food that help warms up your body. There are especially many ramen shops that you can enjoy trying to compare the ramen’s tastes from different restaurant. At “Tsudome Hot Café”, there are also original dishes, aside from hot drinks, softdrinks, etc. Though Sapporo Snow Festival has a strong image of outdoor events, Tsudome has prepare various types of indoor activities. Inside the dome, there are mini Shinkansen, which is very popular among children. The speed is quite slow, and adults could also take the ride with their children. Therefore, it is very safe, even for small children. Moreover, there is also Hokkaido Specialties corner, Stage Show for Children, etc. 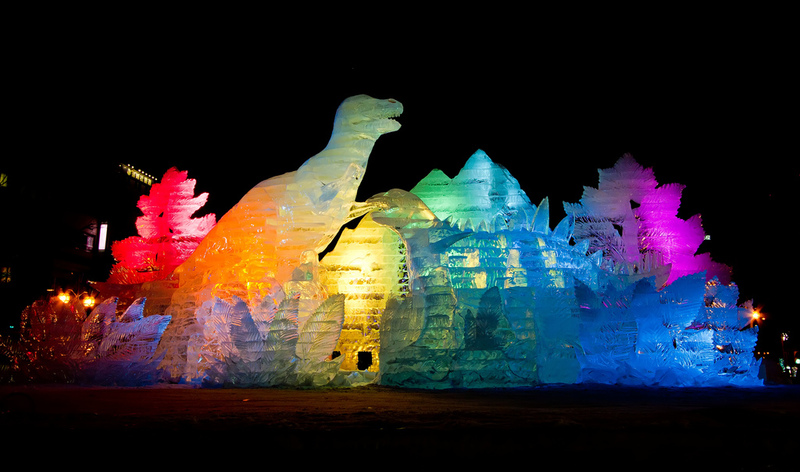 Susukino Venue is Hokkaido’s largest entertainment district decorated with ice sculptures. When night falls, you can enjoy the sceneries of beautifully carved ice sculptures reflected by the neon the city neon light. At Susukino Venue, there is an “Ice Aquarium” which has pickled seafood such as crab, salmon, etc. Moreover, there is also an Ice Bar which is all the furniture such counter, table, chairs, are all made from Ice Block. Visitors can enjoy a unique experience drinking alcohol in an ice bar. Visitors can vote for their favorite Ice Sculptures from the 6 voting box located in the Venue. All the voters have chance winning the lottery for beer, liquor, and many other prizes. Here, you can enjoy either as a judge or as a contestant. Highly recommend to go on the weekday’s morning! It is extremely crowded at night! It is most crowded on weekend and on the last day, and second to that is the opening day. For visitors who dislike crowded places, we highly recommend you to go on weekday’s morning. 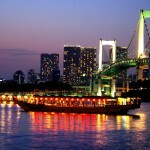 In addition, weekday’s night is quite crowded as well, so we recommend you to spare some time in going there. Furthermore, the sun sets in Sapporo around 16:00 during this period and there will be light up around 17:00. We recommend you to enjoy the festival from noon until the evening and leave the venue in the dinner time when it is crowded. ・Please prepare preventive measures against cold. 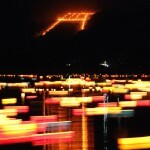 ・During the Sapporo Snow Festival period, sometimes the temperature is drops below freezing points.